Many children only get 1/3 of the recommended level of omega-3 DHA, which supports healthy brain function. 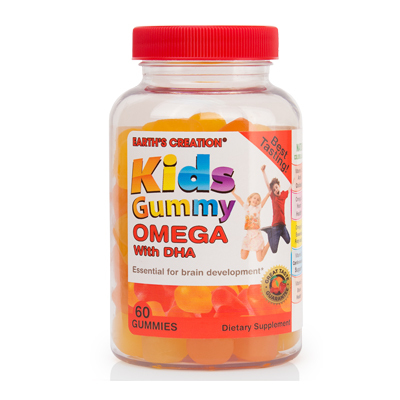 * Earths Creation Omega + DHA® is specially designed to contain all three Omega fatty acids in a great tasting gummy. Omega-3 is an essential vitamin needed for children starting at a very young age. Omega fatty acids support healthy brain development. Studies show that children who have higher levels of omega-3 in their blood have better reading and memory, and have fewer behavior problems. The brain is a very important organ in a human’s body, and that is why it is so important that we give it all the essential things it needs to function properly. This product as the perfect combination of Omega-3 +DHA to help in the development of your child’s brain; not to mention it tastes great as well.